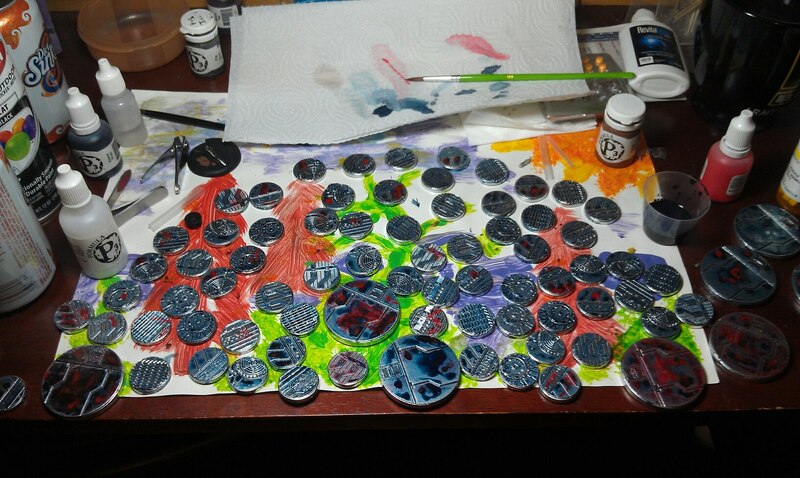 Having to paint up 80+ bases is a daunting task for me. However, I knew if I wanted to play the game, I couldn’t just glue the models to the bases. I had to paint them first. Anyway, simple spray paint black, then paint with an aluminum color. Next step mix a lot of a single color wash. I wanted a blue color, so I added some turquoise ink to P3 armor wash, added some green ink, flow improver, and Future Floor Finish for the first coat. The next to last step was adding pure red ink with some mixing medium and making some blood splotches here and there. The last step, which I still need to do, is to spray them with my Testor’s Dull Cote to tone them down some. 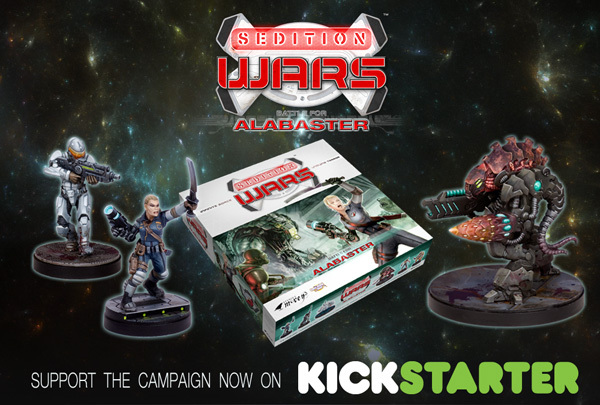 So, just like the other 4,277 backers, I jumped in and backed the Studio McVey and Cool Mini or Not game Sedition Wars: Battle for Alabaster on Kickstarter.com. I jumped in at the Biohazard level at $100 which gets me all the cool stuff added to the base game. In addition, I kicked in for all the extra models (+$75) and terrain (+$30) and a double set of tiles (+$25). You get 98 models in the base set, plus all the great sci-fi homage figures from inspirational things like Dead Space, Firefly/Sereneity, Pitch Black, and more. The mechanics look interesting with the Strain models being able to evolve into more / different versions phase 1, 2, 3, etc, and since the models come from Studio McVey, you know the sculpts are going to be top-notch. The main game is supposed to be shipped in November with all the cool stuff shipped in March 2013! That’s a long time to wait, but it will be well worth it. Furthermore, Sedition Wars is now the #1 backed board game on Kickstarter with a total raised of $951,254, almost one million dollars, surpassing Ogre from Steve Jackson Games by roughly $30,00.